Who doesn’t love a good beta every now and then? If you have purchased Falcon Pro, the third party Twitter app that we have discussed time and time again, then you will now be able to join a recently launched beta program to help improve the application. In the beta program, which is hosted on Google+, there is a feature request list, a section for bugs and also a general discussion area. To join, you will need a Google+ account. Once you join the community, all you need to do is enter yourself as a tester, then download the “update” from Google Play. 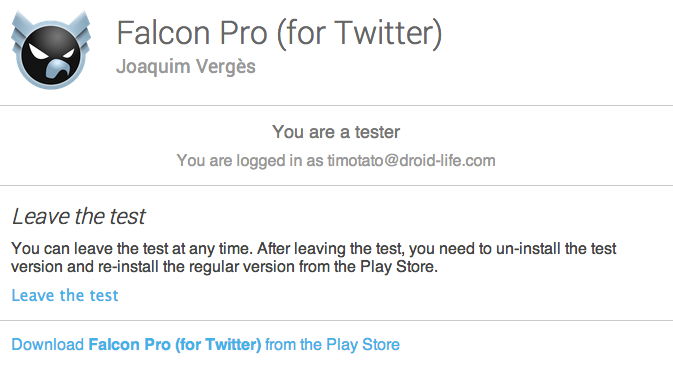 You can remove yourself as a tester at any time if you want to revert back to the public release version. Now, go join the Google+ community and download the beta app once it is made available. It isn’t live yet from what we can tell, but we will update the post once it is. Update: The update is now live on Google Play. Go grab it! Join the beta on Google+. Cheers Joaquim and everyone that sent this in!